Hi, I noticed that Poweramp is showing opposite icons while pausing and playing music in the notification panel. It shows a ▶️ while playing music and ⏸️ while pausing music (look at the top left corner of each picture next to the "Poweramp" text, ignore the black background), which is supposed to be opposite. 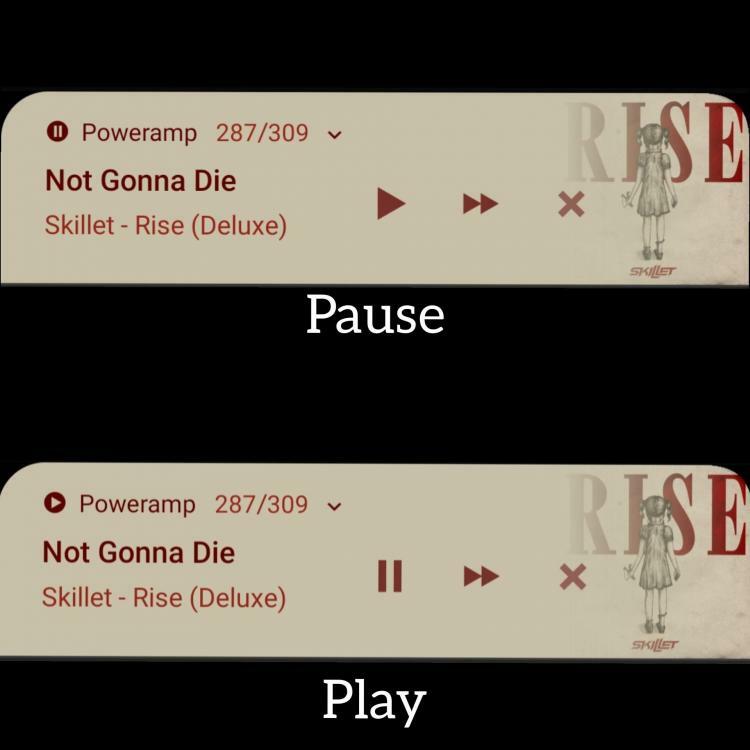 The "Pause" & "Play" indicate the current state of the music. They should be buttons, not indicators. So you press the Play triangle to start playback, and the Pause split-square to pause it. That's what I see on my device anyway. Yes, you're right. But, the small triangle icon next to the "Poweramp" text in the top left corner is opposite of what the current state of the song is. If you play the song then that icon at the corner turns into a split square and when you pause the song the icon at the corner turns into the triangle, they work in an opposite manner. I can send a video or a GIF if you want to see exactly what I'm talking about. Ah, I see what you mean. Yes, you are correct, that small display symbol is not a button - it's rather too small to be one anyway. It is part of the Notification status line which in PA's case shows the current playback operation (including track number, number of tracks, play/pause status, etc) . Not all versions of Android show it in that way, it's a bit dependent on your ROM. Ah, I see what you mean. Yes, yo﻿u are correct, that small display symbol is not a button - it's rather too small to be one anyway. It is part of the Notification status line which in PA's case shows the current playback operation (including track number, number of tracks, play/pause status, etc) . Not all versions of Android show it in that way, it's a bit dependent on your ROM. I use a Samsung Galaxy S8+ (Exynos variant) that runs on the stock One UI ROM running Android Pie. Yes, most newer versions of Android show notifications like that. Go back to Lollipop/etc and there isn't the same header line. It's quite normal anyway. Yes, I guess they are. I hope the developer fixes this issue in the next update. I hope the developer fixes this issue in the next update. It's not an "issue" as that's how it is meant to work, so no it won't be "fixed".